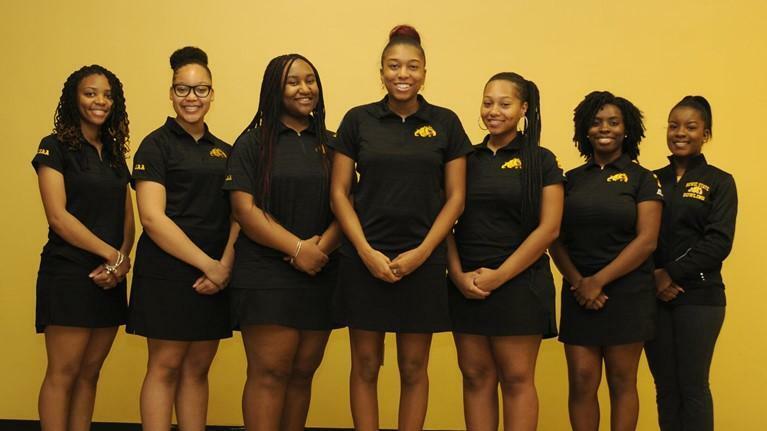 Bowie State University women’s bowling dynasty under head coach Andrew Campbell continued as they won their fifth straight CIAA Championship defeating Fayetteville State University 4-2. The win also marks Bowie State’s ninth overall CIAA Crown and eighth in 10 years. The Lady Bulldogs won the double-elimination tournament by scores of 135-165, 177-190, 152-136, 154-147,190-187 and 191-180. Bowie State went undefeated opening rounds, defeating Livingstone 4-0, Virginia State 4-3 and Virginia Union 4-1 before facing the southern division champion Fayetteville State Broncos for the title. The Broncos took the lead with a win in game one victory over the Bulldogs by a score of 151-137 to open round six. With the match tied at two games apiece, game five was pivotal. Despite five consecutive strikes in frames 3-7 for Fayetteville State, the final frame was vital as Bowie State edged the Broncos 190-187. The Broncos took game six with a score of 200-173 for the overall 4-2 round-six victory. Game six came down to the final frame as Bulldogs scrambled for a 191-180 win over the Broncos to claim the 2019 CIAA Title. Senior Diamond Carter and freshman Cayla Snowden were selected to the All-Tournament Team. Carter was also named the Most Valuable Player of the Championships for the second year in a row.